If you are a certain age you are well aware that Smokey the Bear wanted you to help prevent forest fires and Snuff McGruff wanted you to help him “take a bite outta crime.” These were just little cartoon commercials, but they still planted that idea of what you should do to help out. Growing up there was no better program on television that instilled the idea of taking the time and effort to improve the ecosystem, while still being an action packed show that you and your friends played on the playground, than Captain Planet! Every episode had a lesson about the necessity of not polluting the earth. When the evil polluting villains became too much for the Planeteers to handle they called on Captain Planet to help save the day. It has been many years since I have watched the show Captain Planet, but every Earth Day I think back on the time I spent watching that show, or arguing over who would be Captain Planet and who would be a Planeteer on the playground. Whether you remember the cartoon or not, take time this Earth Day to be a Planeteer again. Teach the children you love those ecological lessons you learned. Show them the importance of planting a tree, recycling, picking up trash, not leaving the water running and changing out old light bulbs for more energy efficient ones. If you live in Missouri take time this Friday April 25 to come to Jefferson City and celebrate Earth Day! The celebration will be from 10 AM to 2 PM on the State Capitol south lawn. It will be a day of fun and education with exhibits, presentations and crafts! While you are there, you will learn about the Adopt-A-Highway program, which is in its 27th year, and how to volunteer to help make Missouri roads cleaner, more attractive and better for the environment. You will also hear about the annual No MOre Trash! Bash. The Trash Bash encourages folks to avoid littering in the first place and picking up others' trash to help the environment and the wildlife such as birds, fish, turtles and others that can become entangled or otherwise harmed by it. One such case is the story of Peanut the Turtle. 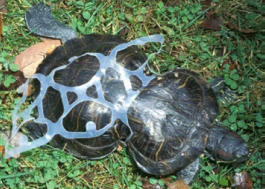 When a young turtle crawled into a six-pack ring that stayed around her as she grew, the trash deformed her shell into the shape of a peanut. Peanut survived, the ring was removed and she has lived with the Missouri Department of Conservation as their environmental spokesturtle since 1993. Take time this Earth Day to be a Planeteer again. Educate the young ones in your life on the importance of making the world a better and cleaner place to live and help make stories like Peanut the Turtle's a thing of the past.